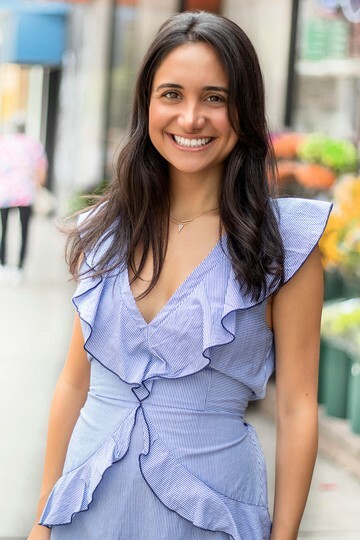 Michelle is excited to join REAL New York in hopes of helping clients navigate the insane landscape that is NYC Real Estate. Growing up in New York has given Michelle an interest in Real Estate from a very young age. She has lived in many different areas of the city and can help find the perfect neighborhood for anyone. She can advise on everything from neighborhood grocery stores, restaurants, shopping, nightlife, and more. She comes from a background of events and marketing experience, which has helped her focus on how to deliver the best possible product to a client based on their specific needs. When she’s not running around the city, Michelle loves to cook and practice yoga! February 2019 by Isabelle B.
I worked with Michelle B and she was FANTASTIC! she was quick and knew exactly what I was looking for on the first shot. I looked at Streeteasy at a specific neighborhood and she immediately referred me to a building that i overlooked and i LOVE my building now. She negotiated and took care of all back end stuff. As I''ve worked with hundreds of brokers before, I can confidently say she was the best I''ve ever worked with. Highly recommended for sure. February 2019 by Samuel B.
Michelle Bassaly was amazing at helping me find a place. I was moving across country and know very little about NYC. She was able to give me a run down of all the neighborhoods and truly listened to what I was looking for. I spoke with 4 or 5 different agents and she was by far the best and really wanted to help. The others were all about getting you in and out. She took me to see a ton of places and each one highlighted different amenities and items I wanted so I could get a full view of what would be most important. I am truly feel lucky to have found her and I love the place that I ended up taking! Highly recommend if you want someone who will focus on your needs and is present throughout the entire process.